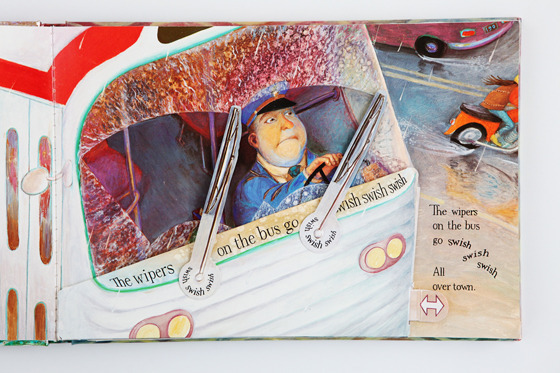 One of Avery's favorite books is this brilliant Wheels on the Bus book, illustrated by Paul O. Zelinsky. "Wheels on the Bus" is Avery's favorite song in the whole world! So, really what could be better than a storybook version of the song? With moveable parts and pop-ups too, which she loves! "The wipers on the bus go swish swish swish," Avery's favorite part! Avery loves turning the wheels. "The people on the bus go bumpety bump!"